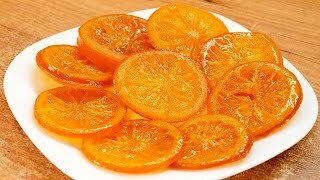 Карамелизированный апельсин / Candied orange slices recipe ♥ English subtitles. Как приготовить? Делаем цитрусовые цукаты из целых апельсинов: используем и корку и мякоть. Засахаренные апельсины лучше и полезнее конфет. Они хорошо гармонируют со сладкой выпечкой. Если их обмакнуть в растопленный тёмный шоколад, то получится просто объедение! Hello! My name is Elena Bazhenova! I'm glad to welcome you at my kitchen! I want to recommend you an interesting YouTube channel.. This is "Beauty Ksu" channel. Ksenia daily shows beauty recipes at home. She uses natural ingredients for all recipes. Link to this channel - in the annotation to the video..
As Ksu says: "Let`s be beautiful together!" And now my recipe for beauty. This is super easy and delicious candied orange slices! For this recipe we will need: 4 oranges, 350g granulated sugar and 50 ml water..
Take a large frying pan. My frying pan has diameter 28 cm of upper edge, 26 cm of bottom. We need a large frying pan or wide saucepan. Pour a layer of sugar. Leveling onto the surface of the pan..
Take the washed oranges. Cut away the peel on top and bottom..
Cut them into quarter-inch slices..
Do not cut all oranges at once, to save juice..
Place the orange slices on sugar..
You can slice one more orange..
Make an oranges layer. Sprinkle top with sugar..
Place a second layer of oranges..
Cut into slices. Remove the seeds and spread on top. Pour 1/3 cup of water here..
Cover with a lid. Put on a small fire. When oranges begin boil, they popple..
Then remove the lid and continue to cook without a lid. 2 hours passed. Exactly: 1 hour and 45 minutes. Some segments have become translucent, ie they are ready.. I do not add water more. We need cook caramelized oranges, but not boiled. In a glass left 2/3 of the water..
Cooked orange slices are translucent.. This edge is not translucent. Transfer cooked slices to a cooling rack or parchment paper..
Continue to cook the remaining orange slices.. The whole cooking process took 2 hours. I placed all orange slices on the parchment paper. I will make orange candies of the remaining candied syrup.. I have put wooden sticks here. They will harden and become orange candy. Leave them to dry off. Orange slices are completely cooled. I placed a few slices on a plate and put in the fridge. They stood in the refrigerator for 2 hours. Orange slices, that are cooled down at room temperature, are more soft.. They are candied, but soft. Cooled in the refrigerator slices become harder.. These are more sticky. That is what has turned from orange caramel..
Beautiful candies. Caramel is soft slightly. The candy will become hard, if it is stored in the refrigerator. Keep it in a glass container and in the refrigerator..
Cook with pleasure and enjoy!.